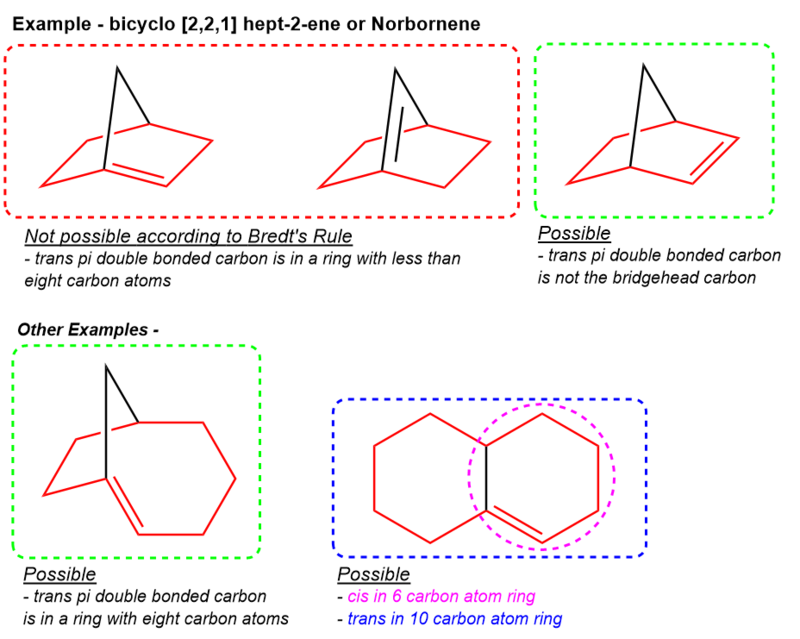 The rule that states that it is not possible for double bonds to be formed on the bridgehead carbon atoms of a bicyclic system if it involves a trans π bond being incorporated in a ring comprised of fewer than eight atoms. In principle, the Bredt’s rule is simply a consequence of the strain induced by a planar bridgehead carbon. A double bond comprises one sigma bond and a one π bond. The pi bond is formed by the overlap of p-orbitals. Therefore these p-orbitals must be on the same planar. If they are not, the chances of an overlap are negligible and the bond formed will be unstable. A double bond on a bridgehead would be equivalent to having a trans pi double bond on a ring, which is not stable for small rings (fewer than eight atoms) due to a combination of ring strain, and angle strain (nonplanar alkene). And therefore, bridgehead double bonds are unstable due to poor orbital overlap. The compound boxed in red cannot maintain a parallel overlap of the p orbitals, has less than 8 carbon atoms in the ring forming the trans pi double bond and as a result, it is not stable at room temperature. Note – the p -orbital of the bridgehead carbon and the p-orbital of the adjacent carbon are not on the same plane and therefore exhibit poor orbital overlap.